On June 21st (local time), Matt Keller, the director of the Global Learning XPRIZE, introduced the 11 semifinalist teams at EdTechxEurope, the largest education technology conference in Europe held in London, United Kingdom, and applause filled the room. The attendees included various experts in the field of education technology, including the global head of Google Play Education Apps, the Program Director of IBM’s Watson Cognitive Science, and the IT Director of Oxford University. The Global Learning XPRIZE is an international competition run by the world’s largest nonprofit venture foundation, XPRIZE. 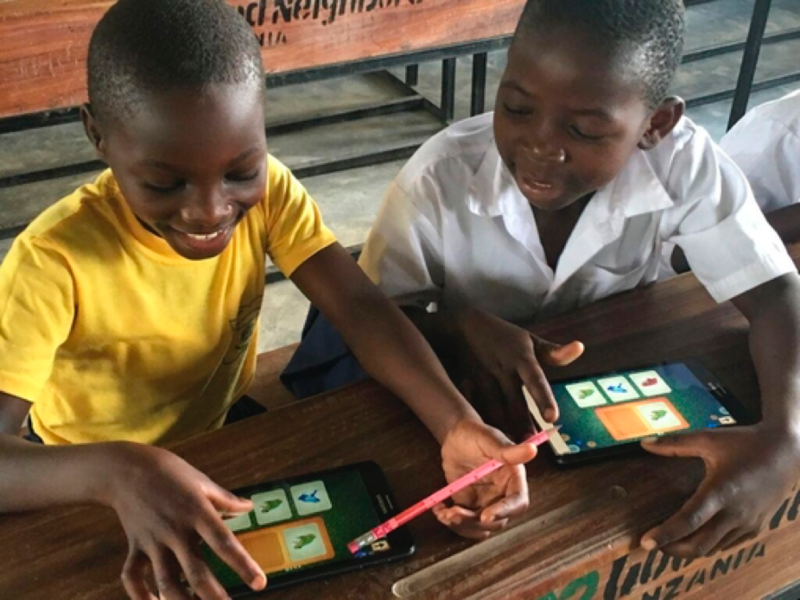 The goal of the competition is to develop a software that will enable children in regions with teacher or school shortages to teach themselves basic reading, writing and arithmetic. Elon Musk, CEO of Tesla, and others have donated towards the US$15 million award. Of the 198 teams that entered the competition, only 11 teams have advanced as semi-finalists. Five finalist teams will be announced on September 17th at the 2017 Social Good Summit, at which point the software they developed will be open-sourced for wider use. Enuma, the startup created by a Korean entrepreneur, has advanced to the semi-finalist stage and is looking to win the competition. Enuma is an education technology startup that was cofounded in Silicon Valley in 2012 by former NC Soft employee Sooinn Lee and her colleague and husband, Gunho Lee. The education app Todo Math, launched in June 2013, gained the spotlight for ranking #1 in the Apple App Store’s education category in over 20 countries, including the US and China. Todo Math is also recognized in the education industry as it is used in around 1,000 US elementary school classrooms. Capital raised from global venture capitals such as K9 Ventures, TAL Education Group, Softbank Ventures has totaled US$5 million. I met with Sooinn Lee at Enuma’s Berkeley headquarters, where she is striving to “improve the world” with education software. －You seem very busy with the XPRIZE competition preparation. “Three team members will be going to Tanzania again this weekend. We are also preparing for the Android launch of Todo Math in China. When I look back on my old job in Korea where I worked for ten years, even though there were quite a lot of international business trips, Korea, U.S. and China were each a separate business unit. But now it feels like I work in a borderless world. －It must not be easy to create education content for the global market. “Our app is in over 150 countries through the Apple App Store. Unlike apps of the past, there is not a high barrier to entry. Todo Math is currently available in 8 languages. English, Korean and Chinese are created in-house, but for the other languages, we work with a localization agency to create the voice files and apply them. －Having team members with the right skills must be important. “We are a unique team comprised of immigrants, bilinguals, etc. Of our 20 team members, most of us have experienced some form of failure in a foreign country, which makes us better at understanding others who are different. Several of us are also parents of children with special needs. Although we are a team that doesn’t neatly belong to one country, we have the ability to identify the smallest problems and solve them. “UNESCO has attempted to solve Africa’s education problem with digital devices for the past 30 years, but it has not been able to demonstrate success. Most of these attempts used computers, but as the computer is a difficult machine to use, it required separate training. Digital illiteracy was the barrier. Meanwhile, tablet hardware prices have dropped to around $50 per device, creating an environment where digital devices can be widely used. XPRIZE foundation, UNESCO, the UN World Food Programme, and the government of Tanzania started the Global Learning XPRIZE competition. Seeing that XPRIZE’s approach is to focus on the software, I decided to take on the challenge to help children. －What was Tanzania’s education environment like? “There are a lot of misconceptions about what children in Tanzania know or don’t know. About 50% of children in Tanzania do not know what a lion is when shown an illustration of a lion. Children in developed countries know what a lion is by watching TV, but the children we worked with did not have the opportunity to be exposed to such information. －It there a secret sauce of making great education software? “I believe we are one of the best in the world in terms of UI/UX design. We do a lot of research into what is familiar and natural to humans. We are continuously pushing ourselves to figure out how to teach concepts with images, without using letters. －Could you give a specific example? “We carefully designed Kitkit School’s UI/UX, paying attention to details, such as tracing the alphabet on sand or counting rocks on grass. Children are familiar with sand, rocks, and grass. There are also features like tracking the text as it is read aloud, and when the word is pressed, it is repeated aloud. We tried to replicate the experience of a parent reading to a child. We are also conducting user research in parallel. The quality of education content for children in Africa is often low. We try to provide content of a quality similar to what children in developed countries use. － Were there times children reacted differently from what you anticipated? “XPRIZE sent us some recorded footage of their pilot test of our product. Most kids began to engage in the educational games from the moment they unlocked the tablets, but there were a few children who could not proceed forward. When we looked carefully, we could see that they were pressing the camera button and did not know what to do as their screen only showed the photo of the floor. Never having seen a photo or a camera, they did not understand the concept of a 2D image that captures reality. Global Learning XPRIZE semifinalists teams. 11 teams, including Enuma’s, were selected out of 198. The finalist announcement will be made on September 17th. / Captured from XPRIZE website. － Your startup was founded in Silicon Valley. “I am grateful for the size of the dream that Silicon Valley demands. I think working in Silicon Valley also helps build one’s confidence. When I was just starting out, I used to say ‘I am a former game designer and now I want to create education apps for children with special needs’ and to my surprise everyone I met gave positive feedback and that helped me in ways beyond I can imagine. －I heard your first investor helped you a lot. “Manu Kumar of K9 Ventures, a Silicon Valley venture capitalist, was a huge help. Before I founded Enuma, I created an app designed for children with special needs in partnership with my former workplace, a Korean gaming company. Manu saw that product and looked for the team that created it. Manu is a Stanford University PhD and an expert in the field of Human-Computer Interaction. －How is Silicon Valley different from Korea? “The definition of a ‘big dream’ here is not about being financially successful but about changing the world. Even in my case, my dream kept growing — from creating an app that helps children with special needs, to creating an app that children with and without special needs can use together, to creating exceptional educational software, to tackling world illiteracy. I started with a lot of disadvantages. I did not have any knowledge on how to start a business, didn’t speak English fluently, didn’t know anything about American law — I didn’t even have a U.S. bank account. What I had was that I was a mother of a child who was not well. In Korea, people tend to see the shortcomings first. “Raising your child is what you need to work on. If your child is not well, you need to focus on that. Why are you working when your child is not well?” These are some of the common things I’ve heard. Here in the US, people around me and investors tirelessly worked to help build my network. Little by little, they pulled me up and nurtured me to grow. “Why do you think you can’t succeed? You have a great story. You’ll have stronger commitment,” is what I heard in Silicon Valley. －Were there any challenging times? “About a year and half into founding Enuma. It was before the product was launched. I was pitching to an east coast investor and he said, “You are in the education business. Shouldn’t a white male who has a related degree be doing it? Do you think you can be convincing as an immigrant who cannot even speak English well?” In 2013, we won the Best Design award at San Francisco’s Launch Education and Kids Conference. It was an award that comes with an investment opportunity, but we did not receive any. I struggled as I felt I was personally holding back our great product. － Do you have a management philosophy? “Our team members work from home regularly or occasionally bring their children to work. For some team members, they come to the office on Tuesdays and Thursdays and work from home on the other days of the week. The way we work is slightly different from a typical workplace. At first, I was worried as to whether we could work like this, but now I ask myself, ‘If we can’t do it then who can?’ We are doing what others are not doing but I am no longer afraid about it [on the date of the interview, Sooinn came to work with her five-month-old second child]. As a parent, one really frees up for work after getting the children to school and after they go to bed. Enuma conducted two field tests in Tanzania. With KOICA’s support and partnership with international aide agency Good Neighbors, 640 students were involved. / Provided by Enuma. －I can see Enuma’s true colors. “We want anyone and everyone to be able to have at least 2nd grade level reading and math skills. We think that is the starting point. Having this 2nd grade education would allow people to be able to ride the bus on their own, buy something at the store and give the right change, read basic signs. If children with special needs or children in extreme poverty are given this opportunity, it provides the foundation for them to continue learning on their own. －What advice would you give to a future entrepreneur? “On one occasion, I had to introduce myself and I said, ‘my husband and I are operating a nascent education material manufacturing plant.’ My father owns his own business and when you hear the word ‘business owner,’ one naturally associates words like ‘hard work’ and ‘labor.’ On the other hand, if you use the word ‘startup,’ one can forget the core of what startups are all about. Startups are also businesses. You hire people, you work, balance the books, meet your responsibilities to people who lent you money, and must work hard to make money. You can go down very quickly if you are not sensitive to this. This article was translated from the original (written in Korean) for Chosun Biz and bears light editing. It originally appeared September 3, 2017. Graduated Seoul National University with a Fine Arts degree and worked as a game designer at NC Soft. She co-founded Enuma in 2012 in the U.S. with husband Gunho Lee, who graduated from the same university with a degree in engineering and worked at NC Soft as an engineer. 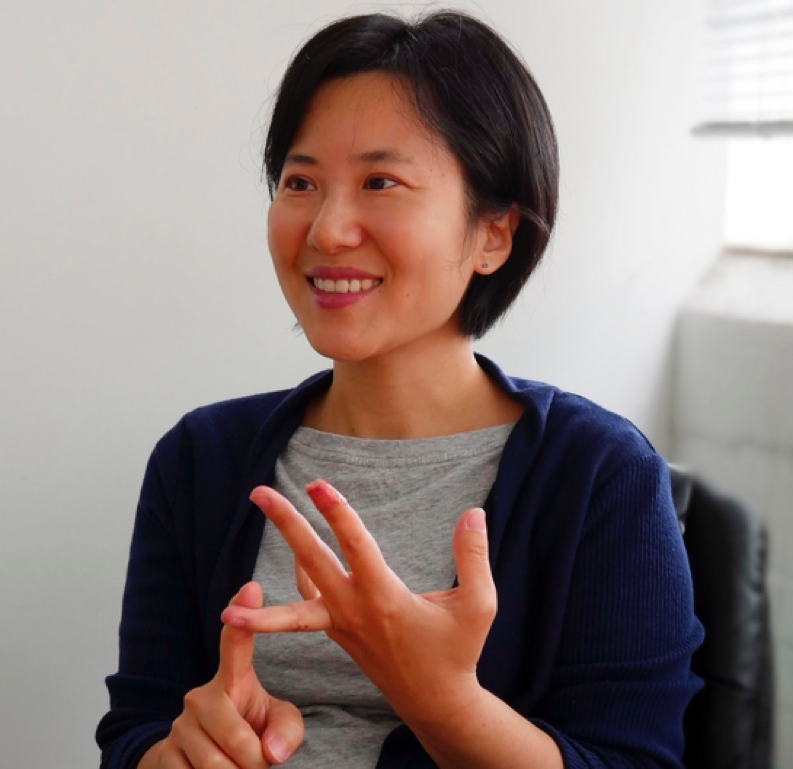 She first gained the spotlight following the release of Todo Math, a math education app created for all children (including those with special needs), which reached number 1 in the Apple App Store’s education/children category in over 20 countries and was awarded “2016 App of the Year” for Google Play Korea. Currently, she is competing in the Global Learning XPRIZE competition, run by the XPRIZE Foundation, which holds other competitions including the Lunar XPRIZE.